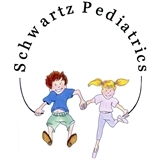 Schwartz Pediatrics (Schaumburg) - Book Appointment Online! He is kind, caring, thorough, and my son likes him. We like him. He has helped my children stay healthy. Bartlett office is better but will return to this office, if necessary.